In your regular life, how often do you end up knowing or even meeting bureaucrats who truly turn out to be the back bone of the system they belong to. The ones who break stereotypes not once or twice but constantly endeavour to leave behind a legacy! These are the ones who love what they do, go beyond their immediate duties and create ripples that benefits everyone who is part of their lives. It all started when I came across a newspaper article. I knew this person! He was the receiver of President’s Police Medal for gallantry for combating terrorists on the fateful night of 26/11. And he is Marathon runner. How does he get the time to run? Set aside running, how does he get the time for himself? 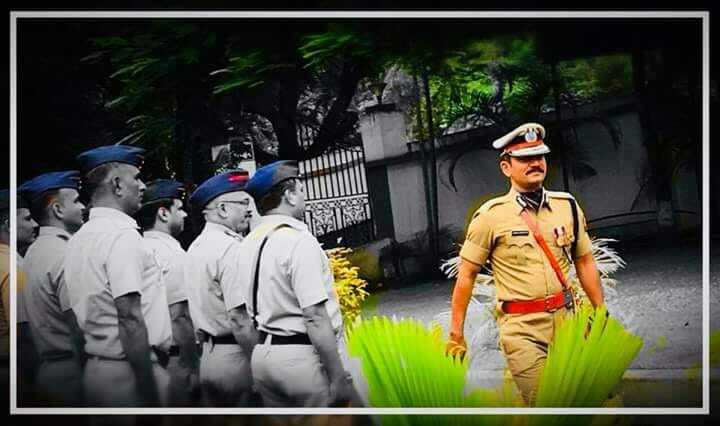 Vishwas Nangare Patil is an IPS officer of 1997 batch. There are numerous articles written about his bravery and audacity and he has also written a book named “Mann mein hai Vishwas”. But here, we are for his lifestyle, his love for running, his marathon achievements, his contribution to sports which makes him stand alone! He and his wife have run various marathons to boost each other up while on the tough running courses. You might have heard about the marathon run organised for 150 police officers on the occasion of Shahu jayanti last year! And guess who was the man behind this? Mr. Patil! Being IG of five districts, it was his duty to ensure that the police officers remain fit but this was definitely an extra step taken by him! And the best part was that he himself ran with them. Vishwas revolutioned the concept of fitness in Maharashtra State Police in a unique way – one that no one has ever done! To make the police a fit force, he motivated the police personnel by promising them postings of their choice if they lost excess weight by Jan 2019! This has been done by training the police personnel over the last 8 months to train for a marathon that will happen this January. The top 25 officers in three different age groups will be given postings of their choice. This initiative is as real as it gets. Read how he has gone about creating this revolution, here. And this stands true in case of Mr. Vishwas Nangare Patil. He promoted The Pune Flow Half Marathon which concluded at Magarpatta City Pune in October,2018 under the partnership with FICCI FLO Pune . This event saw over 10,000 marathoners who ran for women empowerment. It was FICCI FLOW’s fourth edition in Pune and was organised for raising the fund to support the cause of Women empowerment, encouraging entrepreneurship. Also, it was Mr. Patil’s initiative to help the families of 103 slain policemen and army cops of Kolhapur range because of which Bollywood star Akshay Kumar made a humble gesture by extending a cheque of Rs. 25000 to every family on the festival of Diwali. After reading all this stuff, I really wanted to have a word with him. How does he manage all this stuff? I will share few excerpts of his discussion with me. ME: What is your fitness routine? MR. PATIL: I make it a point to give at least one hour to my mind and one hour to my body. For physical fitness I go to gym, run 5kms on alternate days and long distance say 10/15kms on Sundays. I prefer to do weight training on rest of the days training group of two muscles a day. This makes my body toned. For mind I do yoga, pranayama, yoganidra and meditation. Even writing and reading destresses me. ME: Despite a busy and a job that needs very high level of focus, how do you stay fit? MR. PATIL: I think in any of the job you may work for 10 hours and plan rest for the time for you and your family. I don’t prefer to indulge in gossips and spend time in unproductive things. So I get lot of time for myself. Yes I need to travel a lot being IG of 5 big districts. But wherever I go, I take out my sports shoes and run. Or I get cycle and ride in the hinterlands. I see the mountain and I climb and I see the lake, take out my swimming costume and I jump into it! Well this was a hint into the massively motivational life of Mr. Patil. The officers of today are not set in their ways or rigid as we think or make an image about them. They want to learn, excel and make a difference and for that they are ready to extend and bring in every possible resource they can! All that I wanted to convey through this blog is that if these highly occupied public faces can follow a healthy lifestyle, then why can’t we? Why have we surrendered ourselves to excessively-occupied routines where we have no time for ourselves? And I am sure you know the answer! Go Places – Run Different Terrains – Get Tuffman-ed!